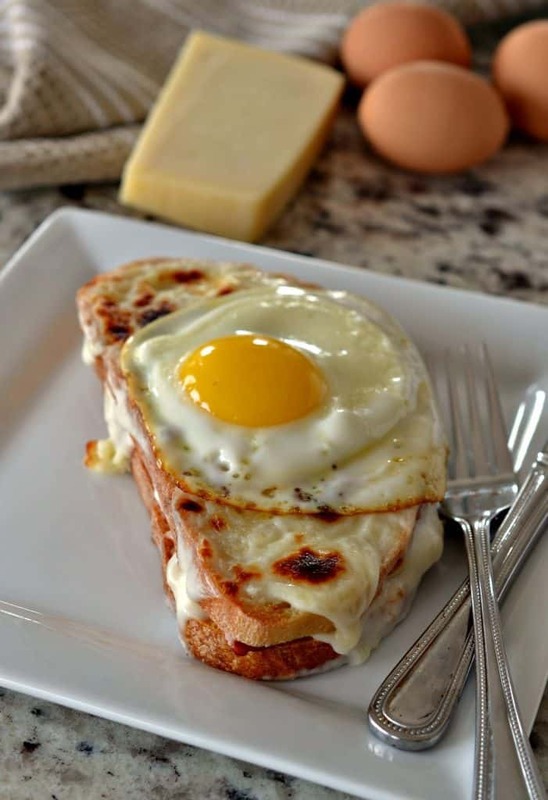 Croque Madame is a delectable toasted sandwich filled with ham, creamy Mornay sauce and topped with a sunny side up egg. This is a must try for all egg sandwich lovers and is the ultimate comfort food breakfast. The weekend is coming make so yourself an outstanding treat. Breakfast is always a priority at our house. Weekend breakfasts are by far the best because we have the time to kick it up and take it off the charts. This French sandwich is by far one of our favorites. The creamy Mornay Sauce is really the shining star in this recipe. This sandwich takes a little longer to make than your average egg sandwich but it is well worth the effort. Mornay sauce is a bechamel sauce with gruyere, Parmesan or cheddar cheese added. Bechamel sauce is a rich white sauce made by adding milk to a roux. Often other herbs and flavoring are added to complement the final recipe. 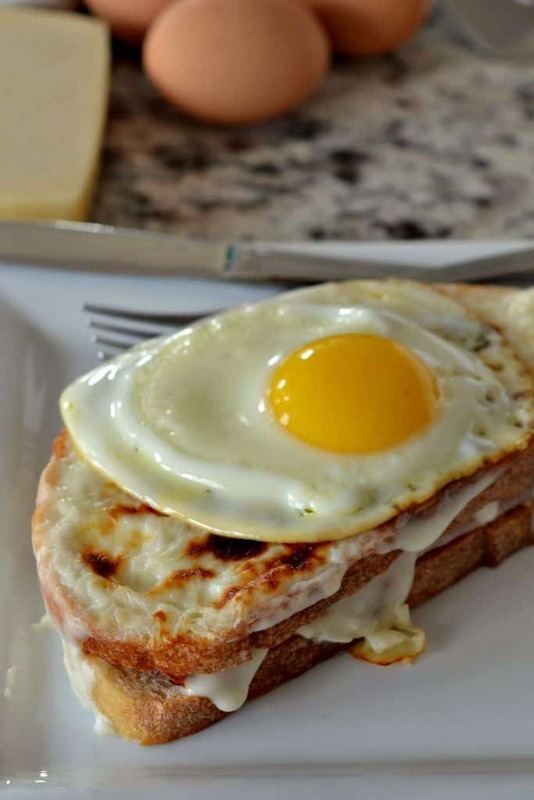 How do you make the Croque Madame? First you are going to make the Mornay Sauce. In a saucepan over medium low heat melt a couple tablespoons of butter. Whisk in an equal amount of flour and cook for a few minutes. Now slowly whisk in the milk and simmer over low heat until slightly thickened. This will take about ten minutes. Remove from the heat and whisk in the cheese in three parts. Season with salt and pepper to taste. Cover to keep warm while you assemble the sandwiches. Meanwhile turn the broiler on and start to prepare four eggs sunny side up. Now pop those sandwiches under the broiler. Watch them closely as everyone’s broiler is different and some are unpredictable. Broil until lightly browned. Finally top each sandwich with one sunny side up egg. Serve immediately. Can Mornay Sauce be made ahead of time? For best results make the bechamel sauce ahead of time. Store in an airtight container in the fridge. Then reheat slowly over low heat. Add just one to two tablespoons of milk if necessary to thin out. Stir frequently and once hot whisk in your grated cheese. Then proceed with the rest of the recipe. 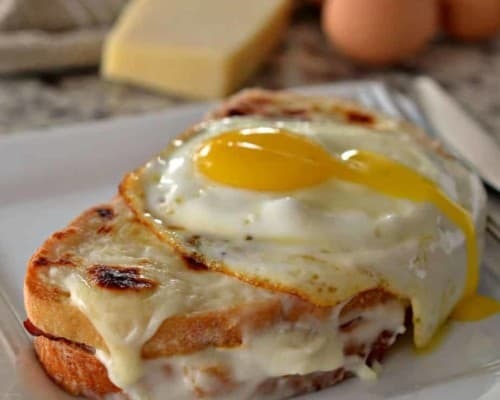 What is the difference between a Croque Madame and a Croque Monsieur? Well I thought you would never ask. They are both sandwiches with Dijon mustard, ham and Mornay sauce. 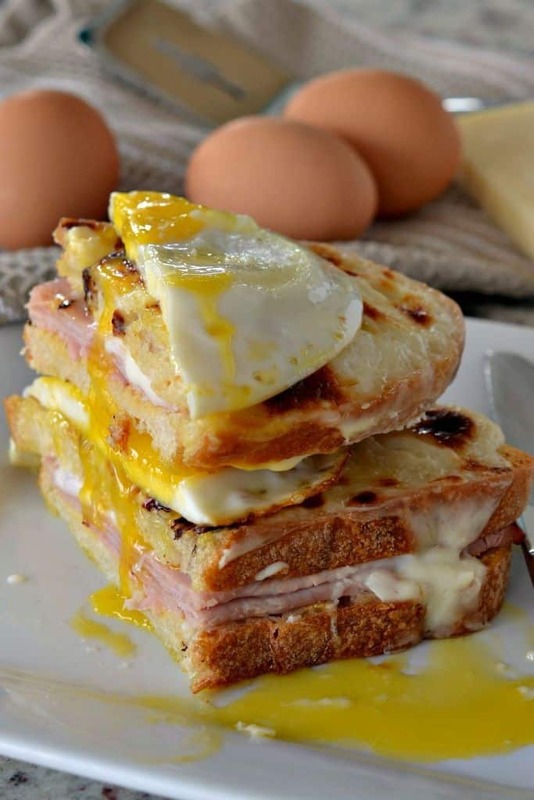 They are layered and cooked the same way except that the Croque Madame has a fried or poached egg on the top. Both are equally delicious and considered a treat. If your mornings are crazy busy like mine give yourself a break and make the Bechamel Sauce ahead of time. Use good quality cheese, bread and ham. It really does make a difference. Watch the sandwich closely under the broiler. Broilers are very unpredictable and you don’t want all this work gone to waste. You can top the sandwich with poached, over easy or sunny side up eggs. Serve promptly so everything is warm and bread is still crusty. So if you love great comfort food sandwiches and eggs than I suggest you put this one on the list to try as soon as possible. In fact what are you waiting for? Add the ingredients to your shopping list today. 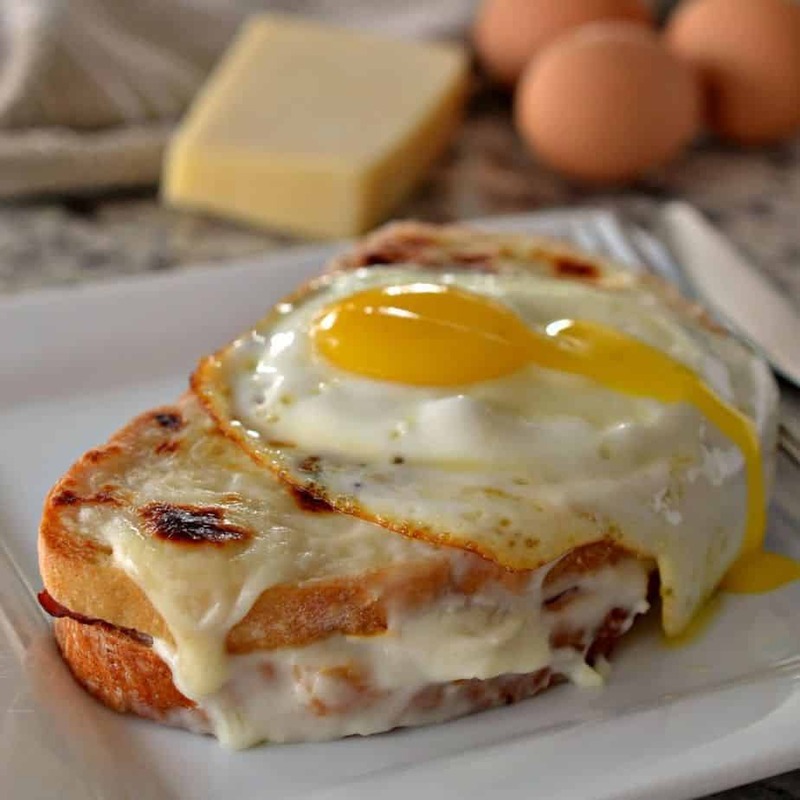 Croque Madame is a delectable toasted sandwich filled with ham and creamy Mornay sauce and topped with a sunny side up egg. In a saucepan over medium low heat melt butter. Whisk in flour and cook for 2-3 minutes; whisking constantly. Slowly whisk in milk and simmer over low heat until slightly thickened; approximately 8-10 minutes. Whisk frequently to prevent lumps and scorching. Remove from heat and whisk in cheese in 3 parts. Season with salt and pepper to taste. Cover to keep warm while you assemble the sandwiches. Cook 4 eggs sunny side up. Place cookie sheet under broiler. Broil until lightly browned. Stay close by as broilers are unpredictable. 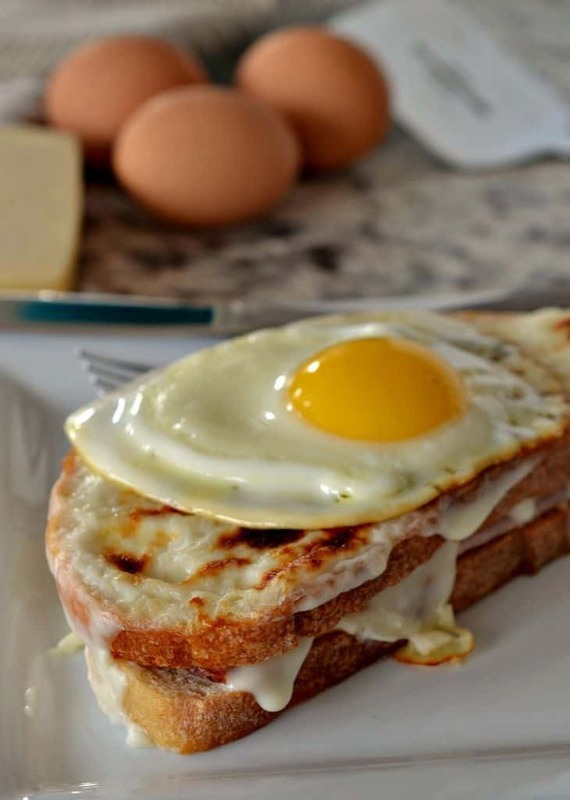 Top each sandwich with one sunny side up egg. Serve immediately. I am adding this to my brunch menu! Such great tips. This is absolutely wonderful! So delicious! It’s been years since I’ve made a croque madame, but your photos have me adding all the ingredients to my shopping list! Perfect. Oh my!! Layers and layers of goodness. For REALS! YUM! This is everything I love in a breakfast sandwich and then some. I’ve never had this before, but that’s going to change ASAP! My gosh the photos are great! I just want to put my hand inside the monitor and take it! I would enjoy this any time of day! Yum-O! This looks nice and simple to put together but so delicious! Perfect for a weekend treat! Now this sounds like something I have GOT to try. It looks and sounds so delicious! If I mae this for my husband he would go nuts. This is the type of thing he often orders when we eat out. What a delicious meal for breakfast! I may actually just have to have this for dinner tonight; looks too good to wait until tomorrow! Im not a big fun of eggs however, this sandwich made my mouth water! It looked so good yum!! Thanks Alex! I hope you enjoy it! How yummy is this!! I love making brunch on the weekends, and will be trying out this recipe for my family, it’s so delicious. 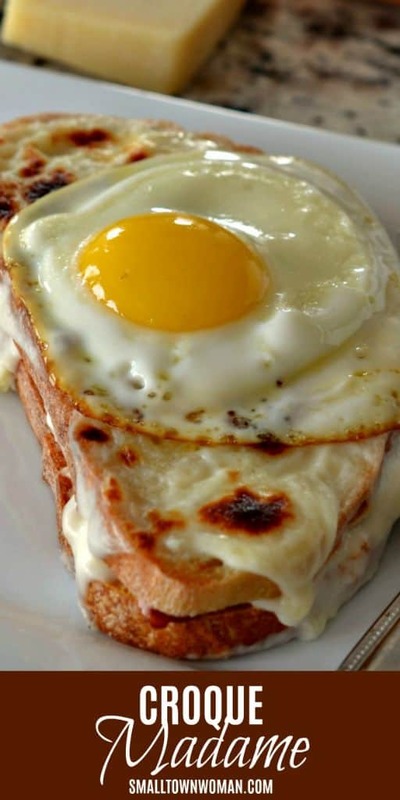 Oh this croque madame looks so delicious! I need to make this, it looks so good. Made this for my husband following the directions exactly, except for the ham (subbed out turkey). When I tell you he was in heaven, I am not playing. I was a little nervous that I wouldn’t get the sauce perfect, but he said it was divine. Awesome! I am so glad that he liked it! it is a delicious sandwich!